Global growth will accelerate to the fastest pace in seven years as U.S. tax cuts spur businesses to invest, the International Monetary Fund says in its latest quarterly update to its World Economic Outlook. 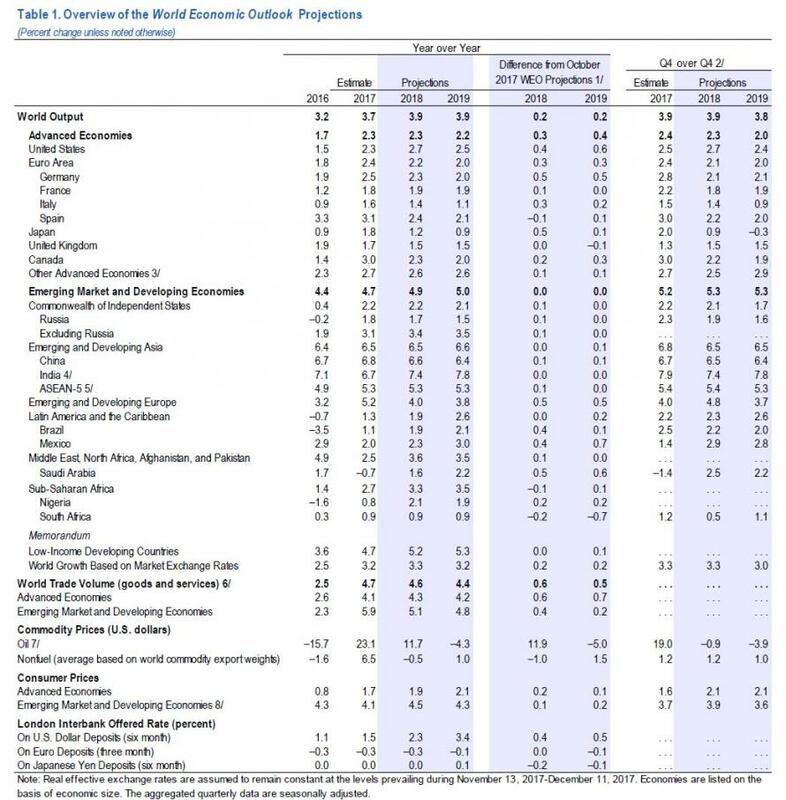 The IMF raised its forecast for world expansion to 3.9% in 2018 and 2019, up 0.2% for both years from its projection in October. That would be the fastest rate of growth since 2011, when the world was bouncing back from the financial crisis. It is also worth noting to what the IMF attributed its rebound in optimism: according to the DC-based organization, about half of the IMF’s global upgrade stems from the Republican tax cuts passed in December. Eurozone: the IMF sees 2018 GDP growth of 2.2%, up 0.3% from October. The fund left its 2018 forecast for India unchanged from three months ago, at 7.4%; it also kept its UK growth forecast for 2018 at 1.5%, while lowering its 2019 estimate by 1 point to 1.5%. Happy days are here again: Global optimism has returned, and the IMF now expecting nearly 4% growth in 2018 and 2019, up 0.2% from just 3 months ago. That would be the fastest rate since 2011, when the world was bouncing back from the global financial crisis. IMF sees US expansion at 2.7% this year, an increase of 0.4 points from October. The Eurozone forecast is now 2.2%, up 0.3% points while China will expand at 6.6% growth. Thank Trump (for now): half of the IMF’s global upgrade stems from the Republican tax cuts passed in December. And while the economy is set to enjoy the boost from tax cuts in the short term, the IMF predicts the tax plan will actually reduce U.S. growth after 2022, offsetting earlier gains. The UK loses: The UK, alongside India, was one of the only key economies to have an unchanged forecast. The IMF left the forecast for UK growth unchanged at 1.5%, understandable given Brexit uncertainty persists, while the UK's 2019 forecast was cut by -0.1%. Finally, the IMF hopes global government will take this period of coordinated growth to implement much needed, and unpopular, reforms. The IMF will be disappointed.